Waste innovator named fifth fastest-growing company for the second consecutive year. 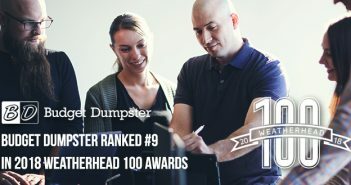 Westlake, OH – Dec. 1, 2016 – Budget Dumpster, one of the leading and fastest growing waste companies in the U.S., has been named to the Weatherhead 100, an annual list of the 100 fastest-growing companies in Northeast Ohio. Budget Dumpster appears on the list at No. 5 for the second year in a row. Campbell and co-founder John Fenn founded Budget Dumpster to disrupt a waste industry niche – temporary roll-off dumpsters – that was ripe for innovation. 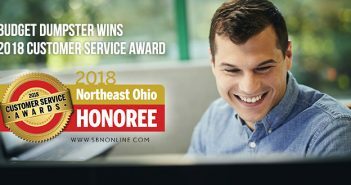 Established in 1988, The Weatherhead 100 awards are the premier celebration of Northeast Ohio’s spirit of entrepreneurship and companies leading the way in Northeast Ohio. To qualify for Weatherhead 100, businesses must have net sales of at least $100,000 in year one of five years required for application, and over $1 million in year five. They must be for-profit companies headquartered in Northeast Ohio and cannot be a franchise or subsidiary of another company from 2011 – 2015. For more information on the Weatherhead 100 and the full list of 2016 winners, visit the Weatherhead 100 home page. Established in 2009, Budget Dumpster delivers affordable waste removal services in most major markets throughout the United States. Working with over 250 local partners, Budget Dumpster sells thousands of temporary roll-off dumpsters each week for projects big and small. 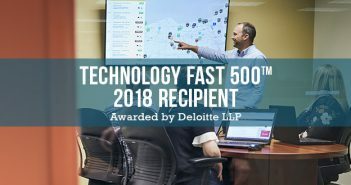 Based in suburban Cleveland with a growing team of over 65 employees, Budget Dumpster has been recognized as one of America’s fastest growing companies by the Inc. 500 (No. 873 in 2016), one of the top five fastest growing companies in Northeast Ohio by Crain’s (2015, 2016), one of the largest waste and recycling firms in North America (No. 67 in 2016) and one of Fortune’s Most Flexible Workplaces (2016). Learn more about how we help people and companies each day at www.budgetdumpster.com.